Gujarat’s most well-known Gandhian Chunibhai Vaidya passed away on Friday at his residence in Gandhi Ashram premises in Ahmedabad. Born on September 2, 1918 in a small village in Patan district of North Gujarat, Sander, he lived in Gandhi Ashram during the later days of his life. A freedom fighter and variously described as an "old-style" Sarvodaya activist, who participated in Vinoba Bhave’s Bhoodan movement asking landlords to “selflessly” give away land to the tiller, Vaidya was one of the foremost supporters of Jay Prakash Narayan’s total revolution and was opposed the Emergency imposed by the Indira Gandhi government. During the Emergency (1975-77), Vaidya went to the Gujarat High Court challenging the government’s decision to seal the office of Bhoomiputra journal, which he edited from Vadodara. Though he won the legal battle, he was detained for seven months for taking part in “anti-government” activities. Vaidya is known among Gujarat activists as synonymous for his concept of “resistance for justice” while working for social development. Vaidya formed Gujarat Lok Samiti, a voluntary organization, in 1980, and among his first successful movements was to force the Rajasthan government to close down liquor shops across Gujarat’s border in Rajasthan at Ratanpur. Other mobilisations he launched included cancelling MLAs’ pension law and pressing the administration to provide drinking water to 350 villages of North Gujarat. His “constructive activities” included insistence on desilting canals. He was instrumental in constructing underground check dams in order to irrigate more than 8,000 acres. While Vaidya supported the Narmada dam, a mega project, and called Narmada Bachao Andolan’s anti-dam campaign as “destructive” and “agitative”, he agitated against the multinational corporation Cargill's proposed project in Gujarat and supported fishermen’s opposition to a mega port project at Umbergaon in South Gujarat. Two years ago, the Gujarat government chose a nearby site, Nargol, to implement the port project, with a consortium of Cargo Motors Limited and Israel Ports Company (IPC) being awarded the Rs 4,000 crore project. An active campaigner to support Kutch earthquake victims of 2001, more recently, despite his old age, Vaidya supported farmers’ organizations – such as the Jameen Adhikar Andolan Gujarat (JAAG) and Gujarat Khedut Samaj – opposing dozen-odd special investment regions (SIRs) being formed across Gujarat. He also opposed "indiscriminate transfer" of grazing land to industries in the name of development. 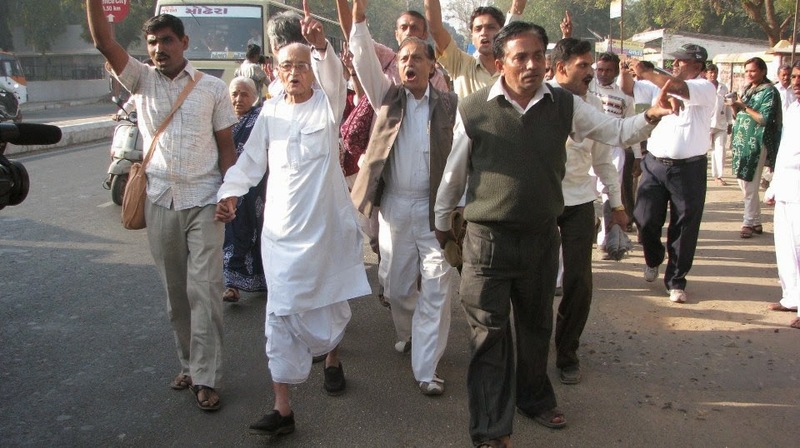 He lent his support to the movement against the Nirma Cement Plant proposed in an alleged wetland in Mahua region of Bhavnagar district of Saurashtra, leading a march against the industrial project from Mahua to Gandhinagar. Right now, the plant awaits nod from the National Green Tribunal nod. A rare leader in these times, having fought against the whole range -- from Indira to Modi. Thanks for such an early posting.